For over 50 years our contributor has cherished an object he inherited from his late father. 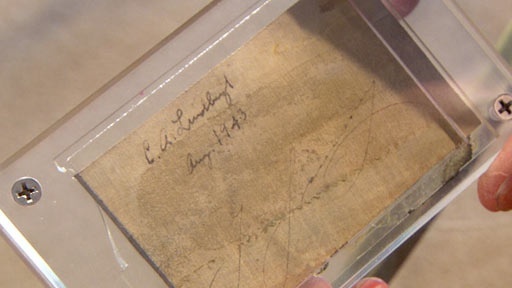 It’s a piece of fabric in Plexiglass with signatures of Charles Lindbergh and Igor Sikorsky and dated August 1943. His father said the fabric came from the Spirit of St. Louis, the airplane Lindbergh flew non-stop from New York to Paris in 1927. But why would helicopter inventor Igor Sikorsky sign this fabric? Since his father died when he was just a teen, our contributor didn’t have a chance to ask more about this souvenir. Also in this episode African American Comic Book Did the makers of this 1950s comic book have more than romance on their minds? Related Investigation China Marine Jacket Can the symbols on this jacket identify a marine who may have witnessed paradise tumbling into disaster? Also with Tukufu Zuberi Booth Letter Did the father of John Wilkes Booth threaten to assassinate the President? Related Investigation Blueprint Special Did this record play a dramatic role in the Allied victory during the Second World War? Also in Depression and WWII: 1929-1945 WWII Diary Does this diary hold the key to understanding the fate of a missing bomber pilot from World War II? Also in Depression and WWII: 1929-1945 Continental Club Card What secrets can this business card reveal about glamour and vice in 1930s Los Angeles?